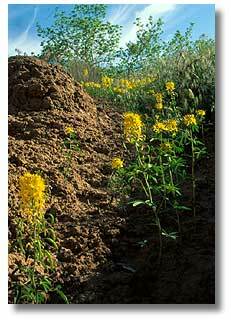 The common name "yellow beeplant" is for the yellow color of the flowers and the attraction of bees to the flowers. The scientific name "Cleome" (klay-O-mee) has an uncertain derivation, but is possibly from the Greek word "kleos" meaning glory, a name given by Greek philosopher Theophrastus to a plant that resembled a mustard. The species name "lutea" (LEW-te-ah) refers to the plant’s color, saffron-yellow. An annual, the plant grows from a few inches to five inches tall with stout stems. Leaves are on the lower half of the plant. They have three to seven elliptical or lance-shaped leaflets that are from three eighths to two inches long. The leaflets arise from a common point like fingers from a palm (palmate). Tiny, singular upper leaves occur on the flowering stems between individual flowers. The flower is borne on a short stalk, and has four petals and six to many stamens that project above the top of the flower. After pollination, the seed capsule that forms is three eighths to one and one half inches long. It hangs downward on long stalks. The capsule contains rough rounded seeds, which emerge after the pod dries out and splits longitudinally. Widely distributed in the western states. Grows from Washington to Nebraska, south to California and New Mexico. The beeplant prefers sandy or disturbed soils, but it will grow in a wide variety of soils, in desert shrublands or pinyon-juniper woodlands from two thousand seven hundred to seven thousand two hundred feet in elevation. Native Americans of the Southwest boiled the flowers or leaves to make a blackish pigment for painting pottery. The leaves, a good source of calcium and vitamin A, were eaten either raw or cooked. Ute Mountain Utes, in the Four Corners Region, ate the seeds of this plant as well. 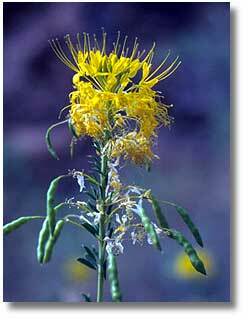 Beeplant seeds are commonly found in prehistoric archeological digs in the Southwest. Both species, yellow beeplant and Rocky Mountain beeplant (C. serrulata), may have been encouraged to grow around the dwelling areas. A poultice made from the leaves was used by the Kayenta Navajo, in northern Arizona, to treat ant bites. is a comprehensive resource about the North American deserts and Southwest destinations. Learn about desert biomes while you discover how desert plants and animals learn to adapt to the harsh desert environment. Find travel information about national parks, state parks, BLM land, and Southwest cities and towns located in or near the desert regions of the United States. Access maps and information about the Sonoran Desert, Mojave Desert, Great Basin Desert, and Chihuahuan Desert.